Coming Soon! A page devoted to the horror writer part of me! On Thursday, Anxiety had been my unwelcome houseguest for a couple of weeks. Its cause, related to my thyroid, had been discovered, and the battle had been engaged. However, like Dorothy in the forest of Oz, I knew it was going to get darker before it got lighter. As I left my house in the morning to go to work, my senses were on high alert. I was aware of my breathing, my footsteps, the sunshine and probably every bird in every tree around me. The white pick up truck jumped out at me. It wasn’t a regular in the neighborhood, and it was parked oddly. Two men stood outside of it, smoking furiously and staring up my block. Staring at me? No, no. Knock it off anxiety. As I opened the door of my car and got in, the two men flung their cigarettes to the ground in unison. As I started driving toward them, they both turned to face the truck. Wait; are they trying to hide their faces? As I passed by them, I watched in my rear view mirror as they got into the truck, started it up, and after letting one car in between, began driving the same direction as me. Are they following me? I kept one eye on them as I continued my drive, and sure enough, they matched me, turn for turn. By now, anxiety had the full complement of fight or flight coping mechanisms turned on. Sweating – check. Heart pounding – check. Overwhelming fear – check. Then, after “following” me for what seemed like a really long time (but really a matter of minutes) they turned into the shopping center where there is a drive up coffee shop. Cigarettes and coffee. For some, a regular breakfast. It took me the rest of my commute to deep-breathe myself into a semblance of calm. The intellectual part of my brain cajoled the out of control emotional side of my brain into accepting that, yes, the white truck and the two smoking men were something out of the ordinary on my street. They truly had appeared to be waiting for someone or something and had driven in the same direction as me. But that was all. Call off the dogs, anxiety. On Saturday, Anxiety was proving difficult to dislodge. I was upping my game with exercise, chamomile tea and crochet. Still, I was having a hard time, and friends offered me dinner and a movie at their house. I knew they were basically offering to babysit me, and I accepted their generosity. Dinner was lovely, the movie was great, and soon I was ready to head home and try to get some sleep. I got in my car, and drove the two blocks home. As I pulled into the driveway, I noticed my motion sensor light at the front door was on. This happened a lot with neighborhood cats taking shortcuts through my shrubs and across my steps. As I turned to open my door and get out of my car, I saw the real reason that the light was on. There, on my front window ledge, was a large rooster, and it looked like it was dead. Its body was folded up and its head and tail feathers were hanging over the side of the ledge. Anxiety came to life immediately. Who would put a dead rooster on the window ledge right next to my front door? Why would someone put a dead rooster on the window ledge right next to my door? What does it mean when someone leaves you a dead rooster? The men with the white truck flashed through my mind. It all made sense. They HAD been staring at me, they HAD been following me. And now, tonight, they had returned while I wasn’t home to leave me this frightening and cryptic message. I slammed the car door shut and raced back to my friends’ house, cell phone photo in hand to show them. The rooster sure looked dead to them, too. Feeling foolish, but frightened, we called the non-emergency police number and tried to describe what was lurking at my house. They said they would dispatch an officer. So, my friend and I headed back to my house. The officer wasn’t sure why he was there. Probably he thought he hadn’t heard right. 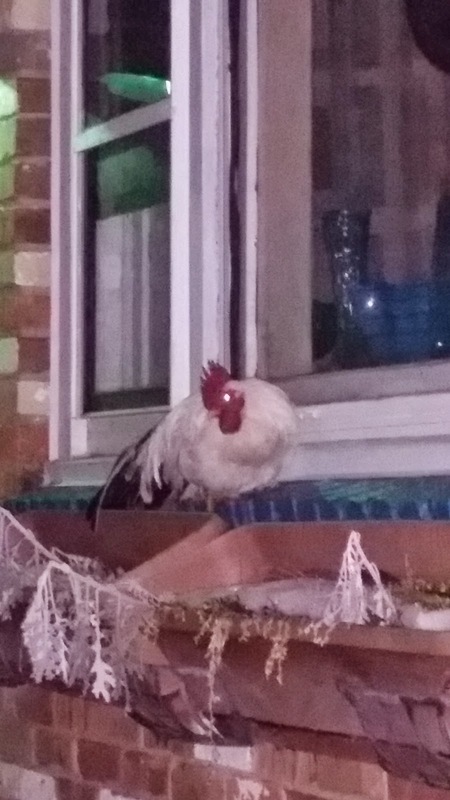 Maybe they had told him “see the lady about a rooster.” He got out of his car and we both approached my front door. He couldn’t see the window until we were up close because of some shrubs in front of the house. Then, as we came around the shrubs, he shone his flashlight on the window ledge. He seemed very surprised to see a dead rooster. “How did that get here?” he asked. How, indeed. Apparently, having enough of us, or feeling a whole lot better, the rooster had jumped to its feet, spread surprisingly large wings and flew off down the street and out of sight. I offered the officer my photo for his report if he thought no one would believe him, but I knew that police see a lot of strange things working the late shift. A resurrected rooster was probably a regular thing for all I knew. Even anxiety couldn’t hold together the men in the white truck stalking me so they could leave a dead rooster on my window story. The sheer absurdity of the idea put enough power into my laughter to deflate anxiety to a little whimpering annoyance. And sleep came a little easier that night. Tracker Panic appears in the anthology "Your Glasses Are On Top of Your Head!" Order here, and help AATH! "Christmas Blessings" which contains, A Toast To Family At Christmas, has been reprinted! Buy it here! One of my photos appears in Carol MacAllister's new book, "Mayan Calendar Reveal"
My humor contribution is number 96 in "501 Ways to Use Humor" by Andrew Tarvin. Don't Worry, It's Just a Stage! Stories of Strength: contains "My Mother's Table"
Oh Sandy: contains "Treading Water"
You Are Here contains "Minetta Women"
Watching Time: contains "My Mother's Table"